The Slingshot Shredtown is an amazing park board whether you want to hit your local cable park or get the winch out and go and do some of your own urban riding. Designed by the Xgames winning Shredtown crew and proven in wake parks around the world. With a nice soft flex and Slingshots flex tip technology too the Shredtown locks and holds a press amazingly well with a forgiving feel so you can press like crazy. Using a continuous rocker profile and Slingshots very durable Ballistic base the shredtown locks into presses and holds them till your hearts content. 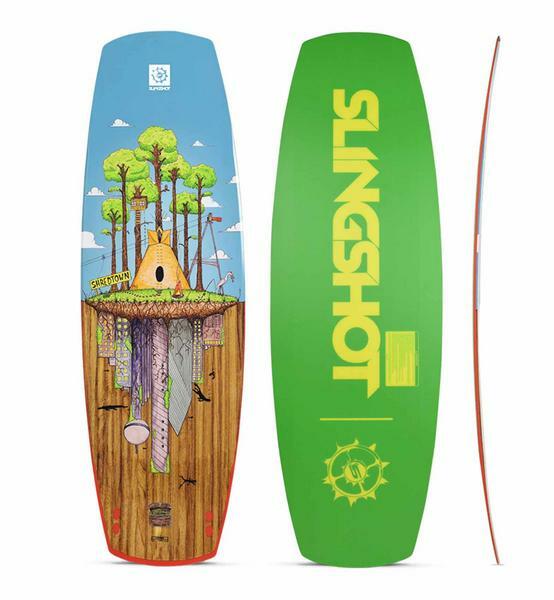 Slingshot also add in their Singleshot sidewalls which are urethane sidewalls which can flex. Urethane, the same stuff skate wheels are made from, bends and flexes so replacing the sidewall with this and bonding it to the core makes the side wall incredibly durable so you can get away with a few more knocks and bangs on your favourite rail. The Slingshot Shredtown is an excellent all round park board, go get one! Fast, efficient park board - Say no more!